Growing up in Canada, Albert did not feel like either a Latvian or a Polish kid. "I knew that I was from an immigrant family, but like so many other first generation immigrant children you learn English and you don't even understand your roots. You somehow sense there's something more to your history, but there's also the feeling of not really having a strong identity," he says. Symbolically, the plane that brought him to Latvia in was airBaltic's centenary plane, with a special Latvian flag livery. It was the first indication that perhaps what he would find would be a pleasant surprise. Before visiting, Albert imagined "there would a lot of bleakness, gray buildings, but it was the opposite," he admits. The false expectations arose from a phrase he had heard from someone who described Latvia as "not as advanced" as the other Baltic states. "There's modern buildings, like the new National Library, then there's the old art nouveau areas, then the old buildings from 17th century, the modern architectural pieces which are very respectful of the existing architecture, and more," he says with his professional architect's eye. 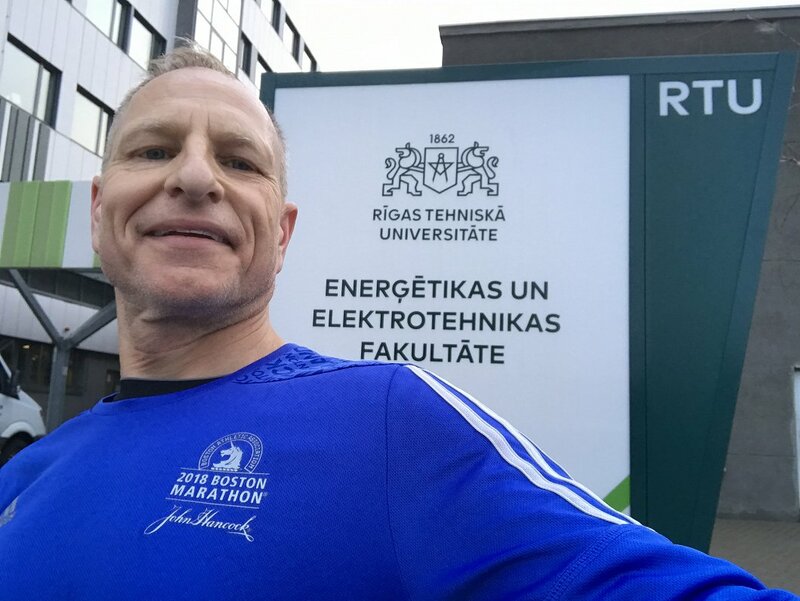 He's a regular runner, but he jokes that running in Riga wasn't very efficient, because he would have to stop all the time to take a look at the architecture. "Riga could be called the Paris of the north, because it's so beautiful. What I also noticed is that people seemed extremely healthy, riding bikes and a lot of joggers in the morning. Maybe "Live long and be happy" could be the slogan for Latvia," says Albert. Albert is technically an immigrant in the U.S. where there is a lot of debate going on about who belongs in the country, and who does not. That too resonates with his family's history. "So this becomes very real. My daughter is a first generation American from my side. A lot of Americans point out that they have been in the U.S. for generations, more than 200 years. Coming back to Latvia made me feel much more like I belong to this civilization." He's planning on bringing his daughter to Latvia to see the city "when it's all in bloom and flowering". 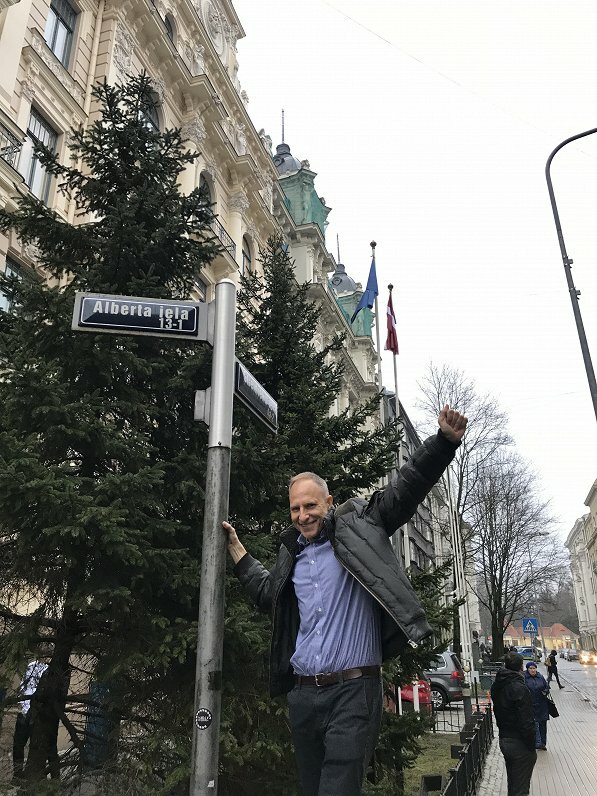 Albert's father had lived in Riga until just before the onset of World War Two before leaving Latvia as a refugee, but was never eager to talk about his experience. "I think he was deeply affected the events in the World War II he experienced," Albert says. Murray (Miernesis) Zulps had lived in a wealthy family before the Russian army occupied Latvian territories. "Then he and his family were held in a detention camp, where they were abused by the guards. His father died in that condition, but he and the rest of his family managed to escape somehow under a fence. They lived on roots and berries in the underground, and eventually [got] to Sweden." As happened to thousands of others at that time, after the war Albert's father and surviving family was housed in a displaced people's camp in West Germany, where they waited for a chance to get over the Atlantic and commence a new, war-free life. "I know that my father worked as a translator for the U.S. military while he was there, but he would never talk about that. Eventually he and his family immigrated to Canada," says Albert. 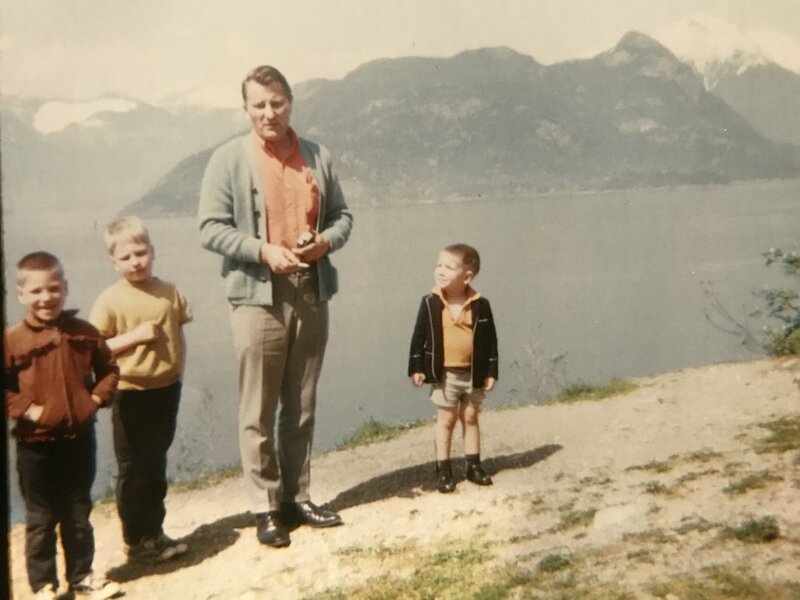 In Canada Murray worked "whatever jobs he could find, bus driver, in real-estate, whatever he could do to make money, to bring one by one the rest of the family over". Once the family was relocated to Ontario, Canada, Albert's father went to work as a prospector in the mountains in Yukon, in North-West Canada. "That's where he met my mom, Mary, who was a school teacher in Mayo, a small mining town schoolhouse, where she was the principal and taught all grades simultaneously. They were married, moved to Vancouver, and that's when I was born," says Albert. His mother was born in Poland, but had also emigrated to Canada right before World War II. She grew up in a family of farmers in Saskatchewan. After high school Albert joined the Canadian armed forces, which gave him the opportunity to travel and value hard work. "It gave me more like a father figure or a figure of authority to look up to. I experienced the type of leadership that I never really had before. Not to insult my father, but he just wasn't around a whole lot. That experience helped me grow into a man and made me understand a sense of duty - it helped me to grow," says Albert. The military also taught him what it meant to serve his country and learn about the world. "Before I was pretty naive. When I grew up, I didn't know about the politics of the world, so that kind of opened me up to world order." Albert's time in the military also made him develop habits that still stick with him and helped him choose a career path. "In the military I often got off the ship in a foreign port, and I would run early in the morning before anybody was awake. So even if it was a dangerous area, I wasn't usually in a dangerous situation, because nobody expects a jogger, whether in South America, Australia, New Zealand, or wherever I happened to be so early in the morning," he laughs. Early morning runs made Albert notice all kinds of different buildings and architecture. "In Lima, Peru, for instance, El Callao, which is a port, there are a lot of shanty towns where people have built their makeshift homes out of whatever material they could find. In other cities, like Paris, I experienced the sunrise over the city, down the Champs-Élysées," he says with enthusiasm. His early career in architecture took him to many different parts of the world. He did his first internship in Japan, then in the Caribbean, and upon graduation moved to many other cities and countries. "It's easy to move around when you're single. The philosophy I had in my life in general was "go to where there is work, wherever that may be, rather than scraping by in a poor economy". Because the economy was not doing so well in Canada in the early 1990’s, Albert traveled to find work in Singapore. Then the Asian economy collapsed and the next logical step, as Albert says, was moving to New York City, where the economy was doing very well at the time. "Because of NAFTA (North American Free Trade Agreement) I was allowed to take a job offer in the U.S. I worked in New York City for several years under NAFTA, then got married, had my daughter Lola, and eventually became a citizen." It was in 1998 and Albert finally settled in the U.S. permanently. As a Skanska contractor, Albert helps architects realize their dreams, often using cutting-edge technology and innovative ways of working. "Building virtually before actually building it. Every day I see projects actually built, instead of sketching on paper possible projects," he says. 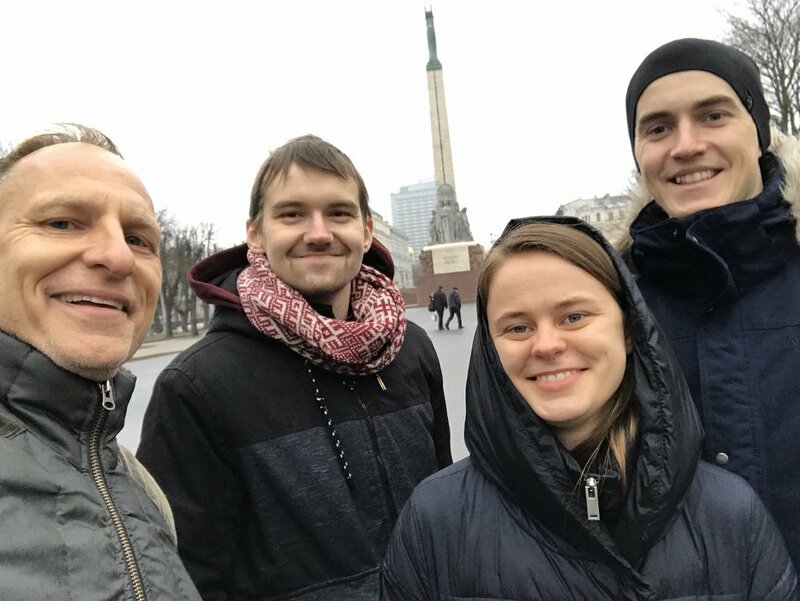 Interestingly, Skanska has hosted 15 interns from the Baltics through the Baltic American Freedom Foundation (BAFF) on a professional internship program. Albert has worked with the majority of them. The first intern to arrive was Miina Karafin in 2013 from Estonia. "First of all, no one could believe that such a program existed. My boss at the time had a contact that told him about BAFF and then she showed up," Albert says. "We were able to have interns explore the latest technology and then report back to us. We had this "secret weapon" with some of the smartest people in the world," says Albert. When describing interns coming from the Baltics, Albert uses such words as "genius", "smart", "motivated", "hard-working" and "positive" a lot. "I don't know what they do in the morning when they get up, but I've never seen any of the interns with anything less than a smile on their face. They haven’t been moody or have any sort of attitude. It's really incredible. I guess they're really happy to have this opportunity too", he says. The first intern from Latvia Albert had to work with was in 2017. "I was immediately curious. He was the first native Latvian I ever met. I asked him some questions about Latvia in general, because I had very limited knowledge about the country, it still seemed very abstract to me. All I could say was that I'm half Latvian by genealogy," he says. 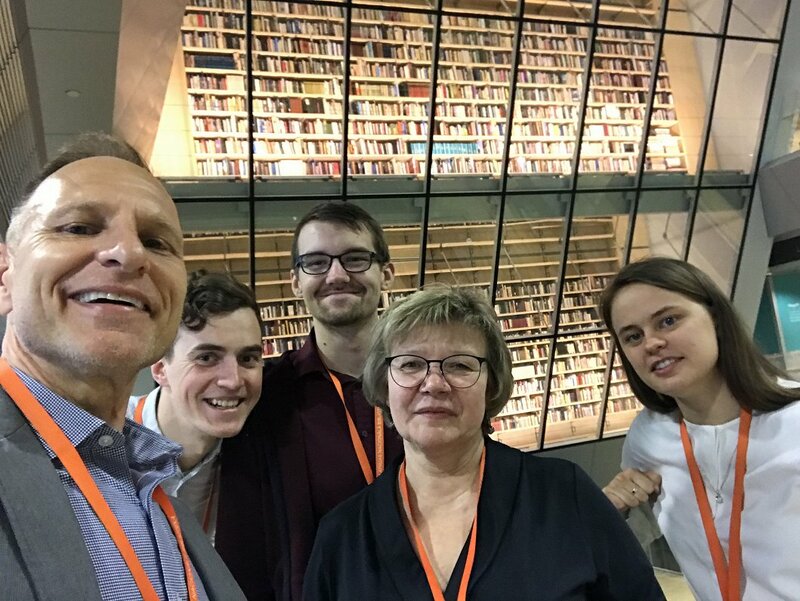 Perhaps because of this link, he has stayed in touch with his Baltic interns since and met them during his Rīga visit - and also paid a visit to an architectural landmark that is the work of another Latvian American architect - Gunārs Birkerts' Latvian National Library.